If you haven't had enough DC movie news in the past couple days, you're in luck, because we've got another very interesting bit coming your way. It was recently revealed that Warner Bros. is developing a DCEU spin-off that will center on Jared Leto's Joker and Margot Robbie's Harley Quinn. It turns out that this project is actually taking the place of Gotham City Sirens, which has been in development since late last year, and won't be happening in addition to the female-centric team movie. The news comes from The Tracking Board. 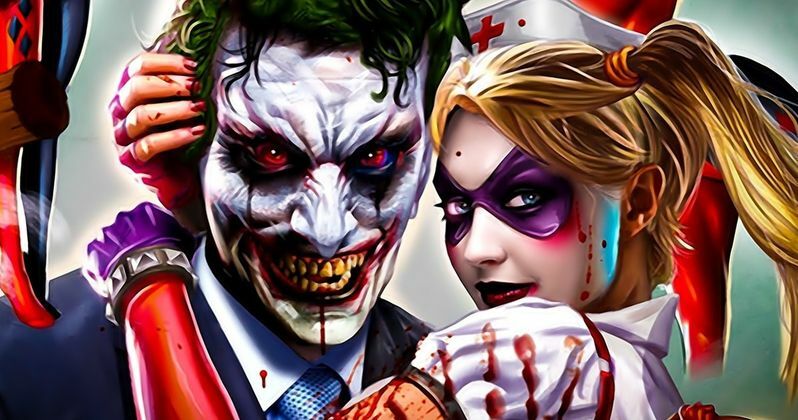 In their report about the Joker and Harley Quinn movie, which is set to be written and directed by filmmakers John Requa and Glenn Ficarra (Focus), it was revealed that Gotham City Sirens has been "reconceived" as Harley Quinn Vs. the Joker, which seems to be a priority for the studio moving forward. Here's what The Tracking Board's report had to say about it. "This project would come on the heels of the characters' reunion in Suicide Squad 2, and would take the place of Gotham City Sirens, which has been reconceived." On the one hand, it's little surprising that Gotham City Sirens won't be happening, since it seemed like something Warner Bros. had dumped a lot of time and resources into. On the other hand, there are a lot of projects with Joker and Harley Quinn being developed right now, and something had to give way. It also recently came to light that Warner Bros. is working on a Joker origin story movie that will take place outside of the DCEU, with Martin Scorsese producing and Todd Phillips (The Hangover) directing. Plus, they just put Suicide Squad 2 on the fast track, so there doesn't seem to be a lot of room in there for both Gotham City Sirens and this untitled "criminal love story" between Joker and Harley. This is just the latest in a big series of news in relation to DC movies at Warner Bros. that also included some confusion over Matt Reeves' The Batman and whether or not Ben Affleck is going to be in it. Interestingly enough, during San Diego Comic-Con, Warner Bros. firmed up their upcoming slate during their Hall H presentation, and Gotham City Sirens wasn't included in the lineup. However, director David Ayer confirmed that he is still planning on making the movie, which he has been attached to since it was announced. If it has indeed been scrapped, it looks like Ayer's era working on DC movies may be over. Suicide Squad was financially very successful, but the production was troubled and the movie was torn apart by critics. Given the success of Wonder Woman, it seems like Warner Bros. is trying to take the DCEU in a new direction, so it would make sense that they might want to distance themselves from David Ayer a bit. As a result, it looks like Gotham City Sirens is dead.